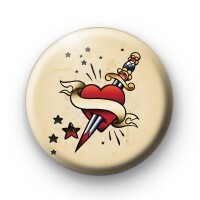 Old School Heart Dagger Tattoo Button Badges in the style of an old fashioned sailor tattoo. A lovely beige coloured button badge featuring a tattoo style heart with banner and dagger with a few red stars. A really cool button badge.